Did you know that practising the movement involved in scissor skills can help children write. Learning to use scissors develops the skills required to control a pencil. Both motions need the muscles that oppose the index and middle finger with the thumb working together. learning new skills can sometimes feel monotonous to children. However it doesn’t have to be this way. The following activities are designed to develop the muscles and movements required to manipulate scissors. In time, the ‘open close’ squeeze action of the arch between thumb and fingers will become stronger. You may need to help your child make the movements with some hand over hand guiding to get started. Use tongs to pick up large pom poms, aluminium foil balls, lightweight plastic toy items, blocks, lumps of play-dough. You can also incorporate food play e.g. picking up cooked spaghetti. Once skills with the activity improve, you can use smaller items, cotton balls, small pompoms. Food items can be used such as marshmallows, small fruits, large nuts, pieces of bread, using the tongs to dip into sauce or icing sugar onto a plate or ice cube tray. 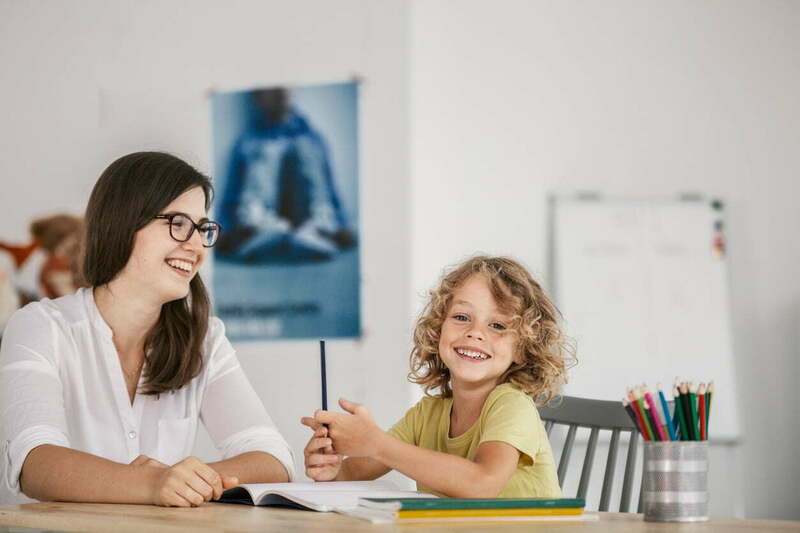 It is important to always place items working from left to right, top to bottom, because later when a child learns to read, scanning left to right is required. These can be used to shoot balloons, or paint with water on the concrete. If you are game, supervised painting activities are fun on an outside easel with different colours for little water pistols. It is very good for index finger strength. Make sure your child is using their dominant hand. Cut strips of coloured paper to rip into small pieces. Some types of paper for example crepe or tissue paper, have a grain and are easier to rip in one direction. Grasping the top of the paper strip with both hands and moving the hands in opposite directions to rip it. Small pieces can be used for collage, the long pieces can be ripped to make jelly fish tentacles, cloud with rain, pretty bird with a long tail, or long hair, grass and so on. A single hole punch is good to improve palm strength. Holes can be punched in a line on card, or make patterns. Lace the card with shoe lace or string, or connect the holes with crayon lines. Small size bubbles, these are perfect for pinching with the index finger and thumb, this strengthens the muscles within the finger and thumb, which will help scissor skill development as well as controlling a pencil. Making hand puppets talk encourages practice opening and closing the fingers and thumb in time with speech. You can make one using a single spare sock, buttons for eyes and wool for hair. Make it eat and grab, bite and tug. 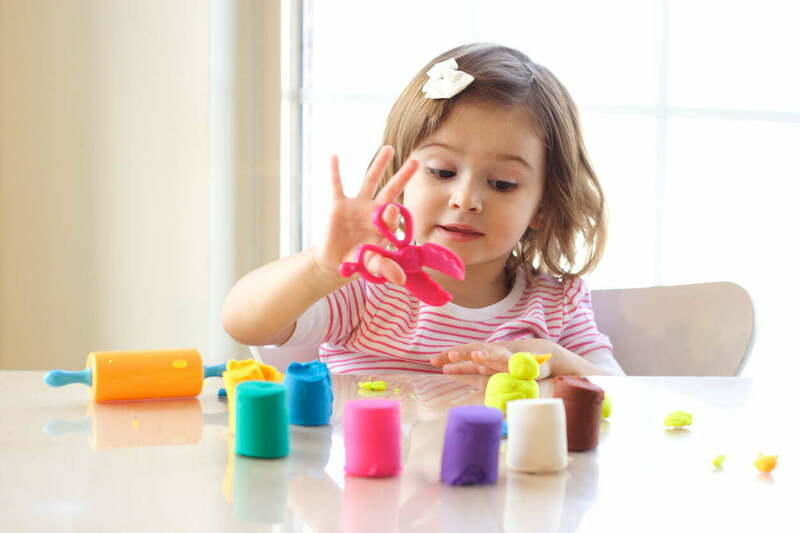 Play dough, especially extra firm dough is excellent for improving fine motor strength. Use a garlic press to squeeze playdough through and make spaghetti hair, squeeze the handles using both hands together. Keep in mind, “both thumbs up”, the dominant hand does the squeezing action “open-shut” steady at the midline of the body, the other “helping” hand manipulates the item to be cut. Practice cutting action using small sized scissors, cutting strips of playdough, cutting a circle of playdough into ‘pizza’, snipping pieces of straw, coloured wool, spaghetti! Make strips of light coloured card narrow enough so that one snip is successful. Draw horizontal lines. These can be snipped off and artwork can be created with the geometric pieces cut. Collect paint sample cards from your hardware shop for cutting practice, snip between the colours. 3) ‘Stop point’. Put a sticker or draw a face at the destination point for the end of one snip, with no line as a guide. Early scissor skills involves ‘snipping’, first things like playdough, spaghetti, wool, straws…then develops to just one short line. More information on the next stages of scissor skills is to come in a later post. And of course if you are worried about any aspect of your child’s fine motor skills you are welcome to contact Reception for more information about our occupational therapy services on 9274 7062.